Christians often talk about serving others, but this concept is rarely explained in depth to children. The Bible is rich with examples of servanthood, but none greater than Jesus in himself. This lesson plan will introduce the meaning of service, specifically in the sacrifice of Jesus on the cross. It is part 1 of the “Servanthood for Kids Series” we will be posting over the month of September. OBJECTIVE: To help students understand that active service for God and others is the true mark of a growing believer in Jesus Christ. MAIN IDEA: Jesus was the ultimate servant during his life on earth because he willingly gave up his life for us. We honor his example of servanthood by humbly serving others in our daily lives. Say, “Today we are discussing what it means to be a servant. First, can anyone define the word ‘servant’?” Allow a few moments for discussion and add the definition of a servant (someone who performs duties for other people) if necessary. Next, explain that there are many occupations which call for servanthood. Pass out index cards with listed occupations (students may have more than one card). Have each student tell the class the occupation on their card(s). 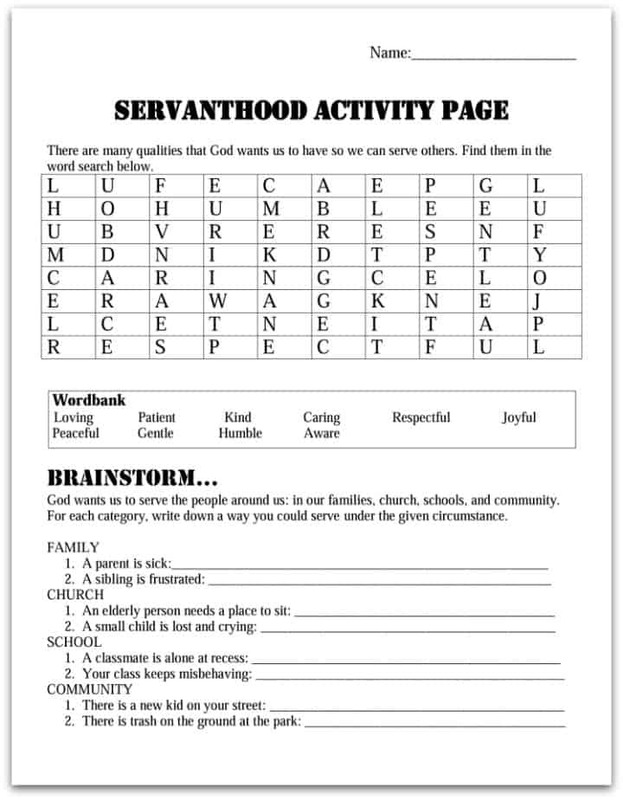 For each card ask, “How is a [doctor, teacher, policeman, etc] a servant?” By the end of the activity, make the distinction that someone’s actions show if they are a servant. Read James 2:26 and emphasize that our servant-like actions as Christians prove that our faith is real. Get ready for the game by picking two different colors of index cards (you will need five of each color). Cut each card in half for a total of ten smaller cards in each color. With one color, list needs in the church, community, or at home. With the second color, list acts of service for the students to match with each need. Say, “We are going to work together to match a need with an act of service.” At the end of the game, discuss each pair of cards and encourage students to serve in similar ways. Pass out the activity sheets and explain that we are going to come up with ways to serve our families, church, schools, and community. RECAP: Serving God and others should be a daily part of a believer’s life. When we chose to think of others before ourselves, our faith in the Lord Jesus Christ shines the brightest. Wow this is so perfect! Them you so much for taking valuable time to invest in so many lil ones in an indirect way! Touching little lives, more than you will ever realize ! this is amazing God bless you,Am Reuben from Tanzania East Africa I am so blessed with your lesson. Tony Kummer (Editor) reviewed & updated this page on : March 19, 2019 at 1:20 pm. All our content is peer reviewed by our readers, simply leave a comment on any post suggest an update.